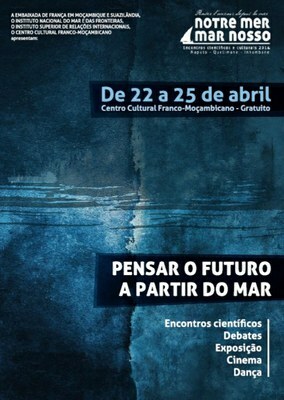 Francis Marsac (IRD) was invited to give two talks at the “Mar Nosso” Cultural and Scientific Symposium held in Maputo (Mozambique), 22-25 April 2014, organized by the French Cultural Centre and French Embassy in Mozambique. This Symposium was open to all public to showcase projects and design new cooperative activities between France and Mozambique. F. Marsac presented ICEMASA as a vehicle for strengthening the existing tri-lateral cooperation between France, South Africa and Mozambique. For long, the current of the Mozambique Channel was thought to be a quiet and rather linear flow of water, following the Mozambican coast. Since the mid of 1990s, with the availability of synoptic observations, through the development of new technologies including satellite oceanography, a totally new perspective was progressively unveiled in the marine landscape of this region. Now, we know that powerful eddies of ca. 100 km diameter, propagate from North to South, through the Mozambique Channel. Doing so, these eddies are reshaping the marine ecosystem of the whole region. Tunas and billfish have been harvested in the Mozambique Channel by industrial fisheries since 1955, firstly by longliners. Tuna purse seiners entered the fishery in 1986. The industrial catches have fluctuated annually in the Mozambique Channel and the average has been around 30 000 tons over the past ten years. By contrast, the fishing fleets of the developing coastal states operate mostly in the coastal domain, and thus have a limited access to the offshore tuna and billfish resources. The deployment of fish aggregating devices has been an opportunity to retain tuna in areas that are accessible to the artisanal fleets. Potential development exists for coastal countries to harvest a greater share of tuna stocks.